So, with our first day in Bali, we had no idea where all the hype was coming from. However, as the days went by we did like the place more. In addition, we also realized that the 'Paradise' of Bali is no longer--the romantic aura of the place is only left in a few hard to find places and now its better to actually check out other islands around Bali [that haven't been polluted and damaged yet,sadly]. Nonetheless, there were a few things we wanted to do while we were here for a week: rent a motorbike & drive around (obviously a must for us! )/check out some famous beaches & spots on the island/check out some of the more popular temples/go to the Gili islands next door/go to artsy Ubud/go scuba diving......hmmm anything else??? The day after we arrived we wanted to rent a motorbike for a 24 hour period. This was not an issue in Thailand, Cambodia or Vietnam, but we read that it could be in Indonesia--in one of the most corrupt countries in the world is there really an issue renting a motorbike?!? Funny! Taking into consideration that Indonesia is very corrupt, we decided to wing it anyway. Our hotel wouldn't rent the bike to us without the special license, but when we walked into town we found multiple businesses that would (ofcourse we lied that we had one & no one even cared to see any kind of license!). Funny enough, although we got a motorbike with some trouble, this was the first country we have motorbiked in which they actually cared a bit about our safety. Here in Bali they actually asked Tom if he had ever driven one before, if he knew how to use it properly, and whether he felt comfortable on the roads. They didn’t really ask these things in the other places we have rented one..... You would think those would be basic questions everyone would ask right? Nope, this is Southeast Asia after all!! We got the bike from 8pm that night to 8pm the next night. We weren't actually planning to use it that first night, but just wanted to have it so we could leave early the next morning. The next morning we left for our first temple, Tanah Lot at about 9am. It was about an hour drive by motorbike, & it was generally a nice ride [minus some moments of heavy traffic]. Tanah Lot temple was amazing. Perched on an island (there is a land crossing in low tide), it sits off the mainland & gets pounded by the waves coming in--so powerful! We could have just sat there all day watching the waves crash into it, often creating a tremendous spray of water. The waves were easily 3-4 meters high ....dramatic! It was a great start to our motorbiking day around Bali! From Jimbaran we headed further down the coast toward Uluwatu, the southwesternmost tip of Bali. Uluwatu is known for its temple perched atop a cliff, but, most notably, is one of the best surf spots in the world--right up there with Hawaii and Australia. Tom was determined to see it, I knew little about it. When you drive down there, the way the road goes, you end up at the temple first, so we thought we might do it first. However, at this point it was almost 4pm so we decided seeing this beach was more important to us. Maybe we would do the temple another time (it was busy with people doing some kind of Balinese ceremonies, which was actually interesting to see. Either way, it was not supposed to be as awesome as Tanah Lot anyways....). *A bit about Bali & its 'ceremonies': Indonesia is the largest Muslim country in the world (i.e has the largest Muslim population in the world), but the island of Bali is actually predominantly Hindu (basically the wave of Muslim influence hundreds of years ago skipped the island). This is where the artsy, ceremonial, superstitious Balinese culture comes in--it is based on Hindu practices. This island is very artsy and creative, and each day is filled with ceremonial processions, offerings, ceremonies, and practices. On every doorstep of every business you see a small square box made of palm tree leaves. Inside you have various 'offerings' for the gods--bamboo, grass, flowers, a cracker, etc. This occurs every day in front of almost every business or home, and you often see multiple ones scattered around from previous days. So they do this every day to make the gods happy. Apparently, during more important days or events, the offerings get a lot more elaborate. Luckily, if they involve food, the food is eventually eaten by the end of the day, so that nothing goes to waste. The sculpture and art around the island is unique & abundant--whether its furniture or artistic jewellery, you will find it here & it will look different from anything else you have seen before. The place just has an artsy, spiritual & musical air to it. Tahnee would love it! So off to the beach we went. The road/landscape gets a lot more hilly the more south you go (reminded me of Manuel Antonio in Costa Rica). 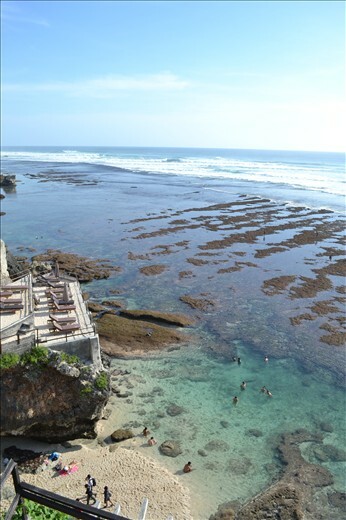 In order to get to Uluwatu beach, you have to park the motorbike on the top of the hilly road, and walk your way down a long set of stairs to reach a 'street' of shops and restaurants overlooking the beach. We didn’t know what to expect (I had never seen a picture of this place) but I was blown away. From the top of this walkway you could see cliffs that surrounded a small white sand beach, with turquoise pools of water smothered in coral and rocks that eventually opened up into the wild, powerful ocean! Enormous waves hurled themselves into these turquoise pools & into the surrounding coastline. And there were many brave surfers out on the water, catching THE PERFECT WAVE that you would see on the cover of the best surfers magazines. This place was absolutely a perfect 10!! I have never seen such a gorgeous, unique beach before--the colors, the waves, the backdrops.....!!! Once we saw the beach, there was no question we would sit around here until after sunset, even if it meant driving back in the dark (which was not the most pleasant experience, but still ok). We went for a swim in the shallow pools off the beach and watched the surfers work their magic. Magic it was! The shallow pools are filled with coral and stones so its pretty uncomfortable walking around in them without shoes, so I wore flip flops while in the water. But that didn’t bother us one bit! The scenery was so amazing that I could have been sitting on lava and not noticed!! :P we enjoyed the sunset at one of the beachfront huts atop a cliff......unforgettable.